A sweet treat for a sweet friend, the recipe comes from “Inside Bru Crew Life”. I had a little sample when I cut them up this morning and they are awesome, the cookie layer was just the tiniest bit dry so maybe a little more liquid added to the dough would help that, otherwise delic! 1 For cookies, beat butter and sugars together until smooth then add egg and vanilla and beat again until smooth. 2 Stir together flour, cocoa, baking powder and salt then slowly add to butter mixture until mixed in well. (Add milk a tablespoon at a time if dough is too crumbly to stick together.) Press mixture into greased 9 x 13″ pan. Bake at 375 for 15 minutes. Let cool completely. 3 For frosting, beat butter, mint extract and whipping cream until creamy. Slowly add in salt and powdered sugar and beat until smooth. 4 Add green food coloring until desired shade is achieved. Beat until color is even. 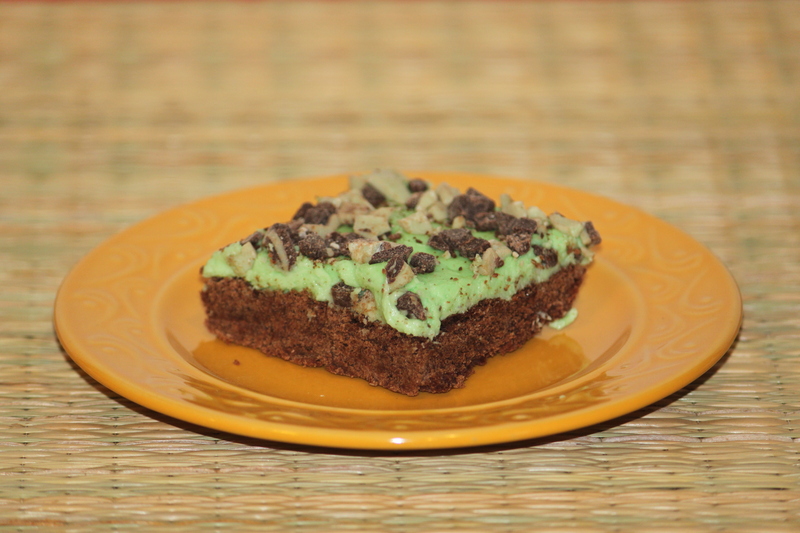 Spread over cooled bars and top with mint pieces.